It’s a contradiction that more and more American CEOs face. On one hand, an opportunity for global expansion of breathtaking proportions glimmers on the horizon; burgeoning new markets in Asia, in particular, promise tremendous potential. On the other, the allure of expanding internationally is tempered by some formidable pitfalls, from anti-American sentiment to political corruption and intellectual property theft. At Chief Executive’s CEO2CEO Leadership Summit, co-sponsored by Bain & Company and Korey Kay, CEOs gathered in New York in late November to contemplate this blend of opportunities and hazards. They also shared experiences in establishing a toehold-or building on an existing one-in emerging markets, namely China, Japan, South Korea and India. Like most CEOs, those at the conference expressed wariness about expansion in Eastern Europe and South America. And while they predicted that Western Europe and North America will remain important, Asia, they said, is where the growth is. Many companies, including multinational firms like American International Group and Citigroup, are focusing on building on an already significant presence in Asia. AIG is firmly entrenched there, with its largest non-U.S. concentration of activity in Japan, China and South Korea. But while CEO Hank Greenberg sees the region as his firm’s No. 1 market outside the U.S., he worries about a range of factors that could fuel swelling anti-American sentiment, including trade disputes, foreign policy and the behavior of American corporations overseas. While Greenberg touts his 100 percent AIG-owned Asia operations, Citigroup Chairman Sandy Weill made an equally convincing case for expanding in the region through joint ventures. Citigroup has been growing its foothold in Japan (where it now earns more than $1 billion a year) since 1902. Partnerships with local firms-including a 20 percent stake in Nikko Cordial Securities and a 50-50 investment banking joint venture between Nikko and Salomon Smith Barney-have factored prominently in its strategy. Already, 37 percent of Citigroup’s $88 billion in revenue comes from non-U.S. markets, and recent moves to angle for market share in China include the purchase of a share of the Shanghai Pudong Bank and a partnership to build a credit card business. The way some U.S. companies avoid having their latest technologies copycatted before their eyes is to simply not introduce them into certain Asian markets. Sealed Air, a $3.2-billion New Jersey-based packaging manufacturer, brings only second- and third-generation technology into its operations in China and India, said CEO William Hickey, because of concerns that its intellectual property will not be respected. “As a result, we don’t bring to those people and those markets the best products we can make,” he said. Ideally, companies need to build teams adept at sensing shifting political and social trends, which then can be charged with delivering relevant information up the chain of command. Such on-the-ground intelligence can provide an early warning of government policy changes, a competitor’s plans or even a terrorist threat to a U.S. company-owned facility. What’s more, U.S. companies should not always expect fair play when negotiating overseas. Come back to your hotel room early from a meeting and you might just find your door locked from the inside and the sounds of activity within. “If you’re involved in a major contract that impacts national economic interests, whether it’s in Europe or Asia, you need to be mindful of economic espionage,” Devine warned. The same communications technology that makes it possible to call home from a cell phone in Beijing or send a file over your hotel phone line has a downside. “Picking off your cell phone or putting a sniffer on your computer and tracking your email is easy,” Devine said. Despite these challenges, after two years of playing defense in the face of corporate scandal, recession and a plunging stock market, the chief executives at the conference argued that the benefits of international sales make continued globalization a must. Tech seems to be recovering. “Old economy” companies are poised for big gains, too. Having survived one of the worst shakeouts in memory, CEOs are relearning how to grow. Even hard-hit sectors such as telecoms are re-emerging. As Corporate America emerges from a lengthy, batten-down-the-hatches period of rigorous cost-cutting, growth is back at the top of the CEO agenda. Yet the CEOs charged with delivering the next wave of growth must do so in a world economy that isn’t growing as fast as it has in past decades. In fact, 87 percent of CEOs say they face a more challenging growth environment than they’ve personally ever experienced before, according to a survey by consulting firm Bain & Co. “This is a more troubling period than companies have encountered for several decades in terms of actually fulfilling the desire to find the next wave of profitable growth,” Christopher Zook, head of the strategy practice at Bain, told conference attendees. The companies that once flew so high are the ones that have been pounded the worst in recent years. Yet the CEOs of such companies as Lucent Technologies, EMC, Orange SA and Corning believe they are back on the path toward growth and profitability. Lucent, for example, is emerging from a period CEO Patricia Russo described as “a totally unpredicted, unprecedented decline.” A $38-billion company at its peak, Lucent slid to sales of $8.5 billion by 2003. Its ranks, once numbering 106,000 employees, dwindled to 35,000. “For a period of time, we were very much in retreat mode,” said Russo. The unforeseen depth and duration of the telecom industry’s decline led to morale-devastating multiple restructurings. “It was like tap dancing on quicksand,” she added. 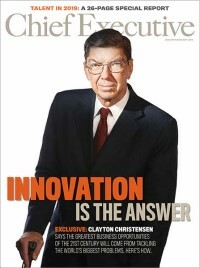 Investing in innovation and product development during difficult times is the key to achieving growth, many CEOs argued. Medtronics’ Art Collins spoke of how his company has increased R&D spending despite profit challenges. Corning’s Jamie Houghton described how his company continued to invest in technologies such as glass for flat panel displays even though Wall Street was urging him to concentrate on fiber optics and become a “pure play,” which would have been disastrous. Sidney Harman of Harman International said he urges his managers to anticipate where the “arc” of technology is going and race to embrace it, even if it means “cannibalizing” existing products. It’s a philosophy that Dicciani fully embraces. “We look at the technologies we have, the product lines, the customer base and the geographic reach, and we build on those things by looking for unmet needs,” she said. “Everybody in our industry likes to talk about slick designs with lots of applications, but I’ve been in the technology world a long time and I know that if we make it simple-one touch, one step-usage will go up dramatically,” he said. “So I’ve got everyone in our company, technologists and R&D people, working on ease of use.” If the use of application or device can’t be taught in 30 seconds or less, “it ain’t good enough,” said Trujillo. Consolidation across technology industries also will help the survivors return to profitability. While data storage company EMC took a tumble during the downturn-market cap plummeted from $225 billion to $25 billion-CEO Joe Tucci views the company as well-positioned to capitalize on growth opportunities. “Throughout that period, we never had a cash problem and today we have $6.2 billion cash and no debt,” said Tucci, who feels technology firms are “in the first inning” of a period of massive consolidation. “So we’re using that not only to grow organically 12 percent, but to try to double that by adding acquisitions.” The company has bought both Legato and Documentum in recent months. While technology firms struggle to regroup, companies in other industries are looking to technology to drive their next wave of growth. At Home Depot, CEO Robert Nardelli described a massive effort to retrofit retail technology in the home improvement giant’s network of warehouse stores. “We’re dragging ourselves from two decades of being behind,” said Nardelli, who recounted discovering soon after taking the Home Depot helm that he couldn’t even send a group email to the company’s store managers. For the GE veteran, that lack of sophistication was simply inconceivable-and a situation he’s spent the last three years working to overcome. “Today, we have mega platforms-SAP for finance and PeopleSoft for human resources-in place, and we’re rolling out a point-of-sale inventory system, cordless scan guns, and 800 self-checkouts this quarter,” reported Nardelli, describing a $400-million investment in technology in 2003. It’s perhaps no small coincidence that CEO Larry Johnston, another GE veteran, is undertaking a similar technology overhaul at food and drug retail chain Albertson’s Inc. With a view of differentiating his stores from less advanced competitors, Johnston plans a $500 million investment in technology to reengineer every aspect of its business-from back room distribution and supply chain systems to the shopping experience for customers on the front end. Looking at growth opportunities for his industry, Johnston pointed to ecommerce. “I believe the Internet will transform the supermarket and drug store industries,” he said. While viewing the market for online shopping with home delivery as relatively small-2 to 4 percent-Johnston deems the potential for building customer loyalty through Internet applications as an immense opportunity. He described a customizable home page portal where consumers can view their purchase data and plan menus, then carry that information to stores on a handheld device. A little success along the way doesn’t hurt, agreed Lucent’s Russo. “Being able to post a positive cash flow, even though it’s only been one quarter, has been a real shot in the arm for the organization,” she says. “I’ve finally been able to tell people that it’s time to close the chapter on weathering the storm-we’ve weathered it. How can CEOs win back the trust and loyalty of skittish stakeholders? It’s been a tough time for any big business to shine in the court of public opinion. Even companies unblemished by charges of malfeasance or morale-shattering cutbacks are suffering from the fallout as shareholders, employees and customers grow increasingly distrustful of corporate behavior. “One lesson we’ve all learned-and our company has learned it in spades-is that reputational risk is every bit as important, if not more so, than credit risk and market risk,” Citigroup Chairman Sandy Weill told the leadership summit. Ultimately, the best CEOs are able to strike a balance in serving all of the company’s stakeholders, recognizing the need to make trade-offs and prioritize along the way. For public companies, which must contend with the sometimes competing interests of customers, employees and investors, that’s a tricky undertaking. Another theme echoed at the conference was that CEOs have paid too much attention to the demands of short-term shareholders in recent years, while shortchanging one of their most important constituencies: employees. At SAS Institute, the world’s largest privately held software company, progressive employee programs have earned the company a reputation as a great place to work. Offerings range from providing on-site, subsidized daycare and healthcare facilities to for-fee conveniences like car detailing, dry cleaning, haircuts and even massages at the Cary, N.C., company’s fitness facility.